Staedtler Royal Blue | Inkdependence! 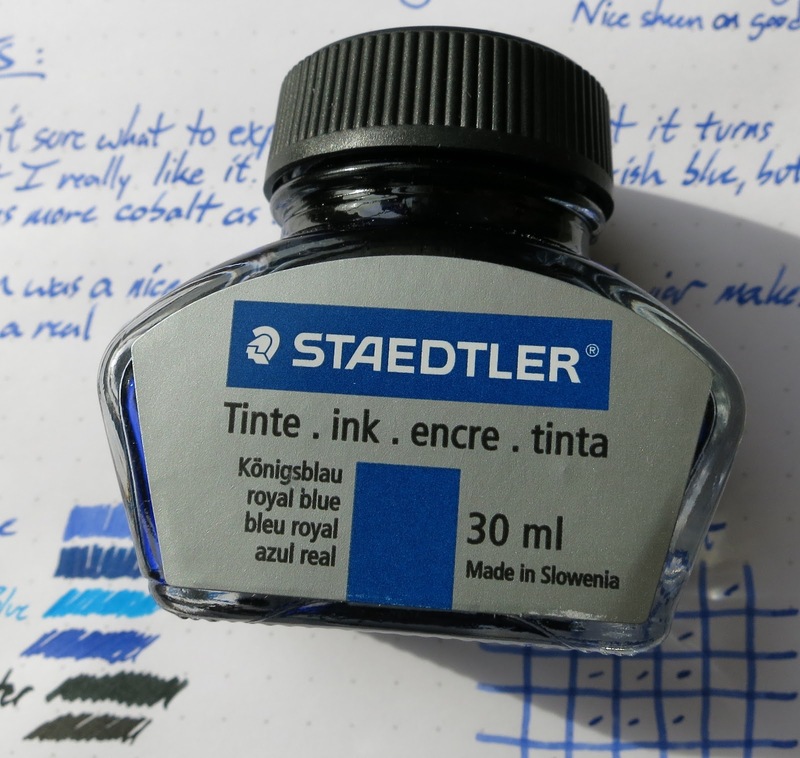 Thanks go to Corey at Staedtler for sending this ink out for review. All opinions (as usual) are mine. 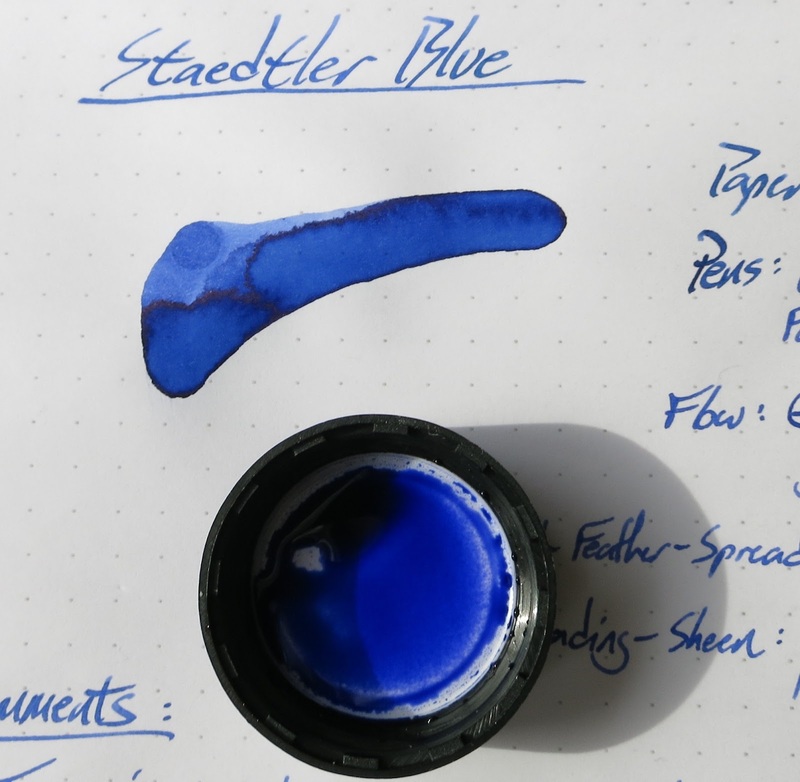 This is an ink that I didn't know existed until the DC Pen Show. 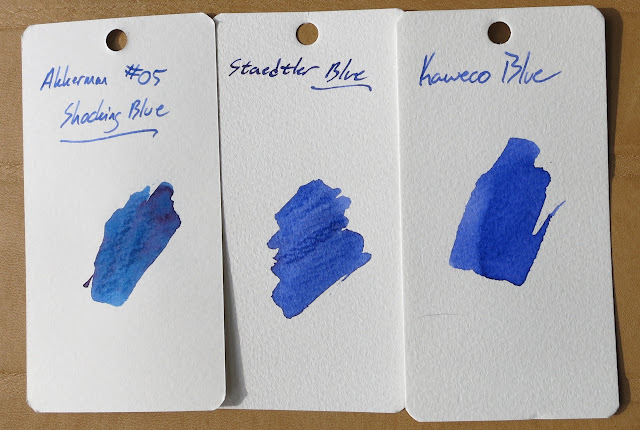 In talking to Corey about their fountain pens (which look really cool to me), he said that he could send out some ink for me to try out. 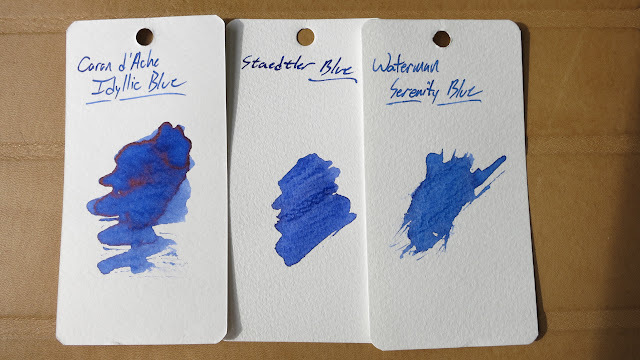 This blue is the first of those. 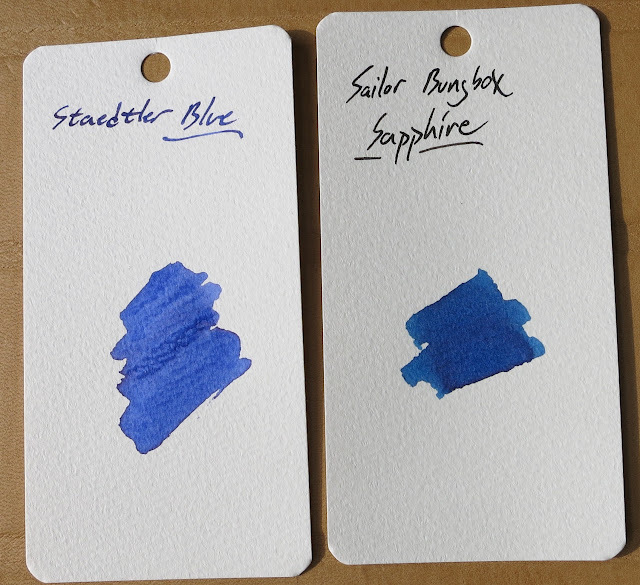 I was sent both bottles and cartridges, and I tried out both of them. As expected, they were the same. Shocker, right? 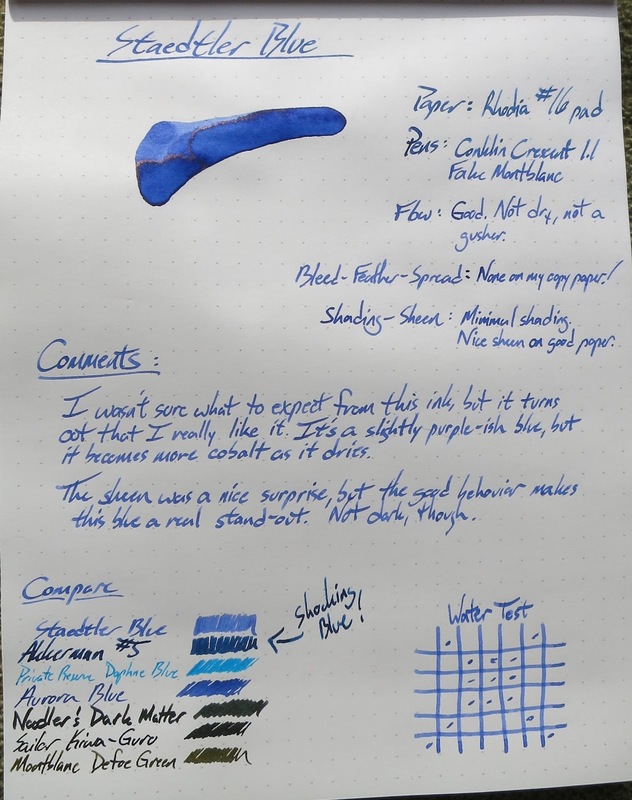 Royal Blue is actually a really good ink. It's a little under-saturated, so it looks pale in the nibs that I used it in. 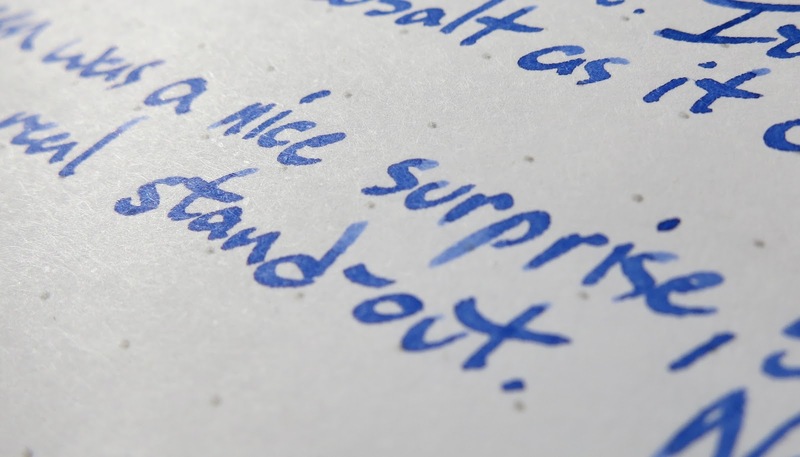 The stub nib on the Conklin is a little on the wet side, but this ink is pretty controlled. I wouldn't call it dry, though. It always starts and never had any flow issues. 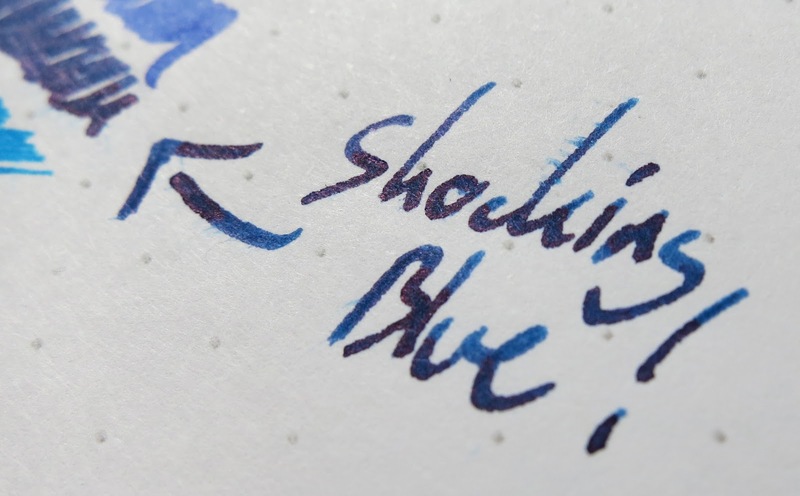 The fake Montblanc has a nib that's marked "F", but it's more like a medium stub. It's also sort of wet, and the smaller nib concentrates the ink a bit more, so Royal Blue looks darker from that nib. 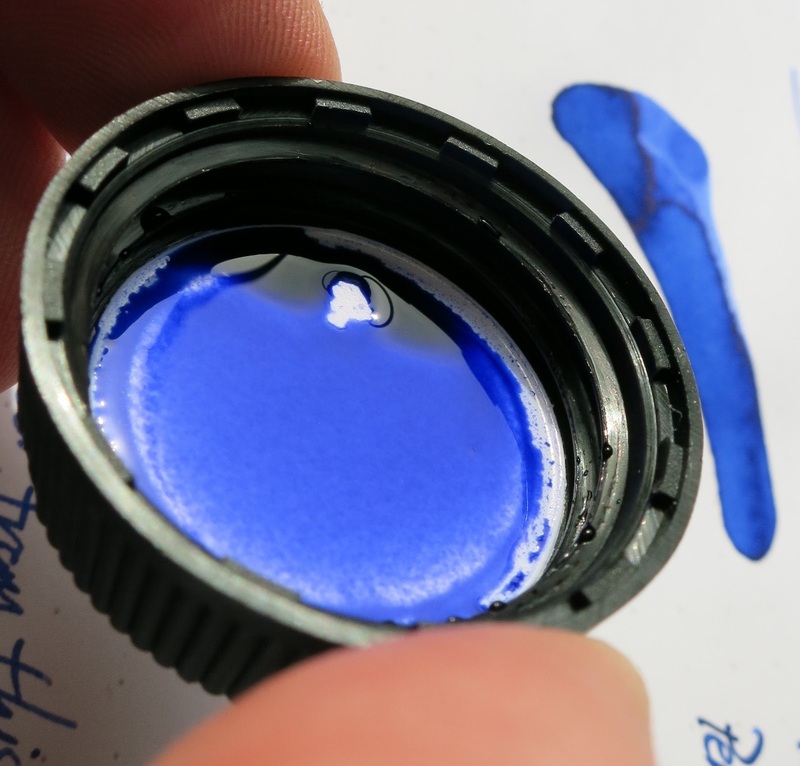 This ink is also a little on the purple side. It looks more purple when it's fresh on the page, but it dries to something more like a cobalt color. It's pretty cool. A little more saturation would be fine with me, though. 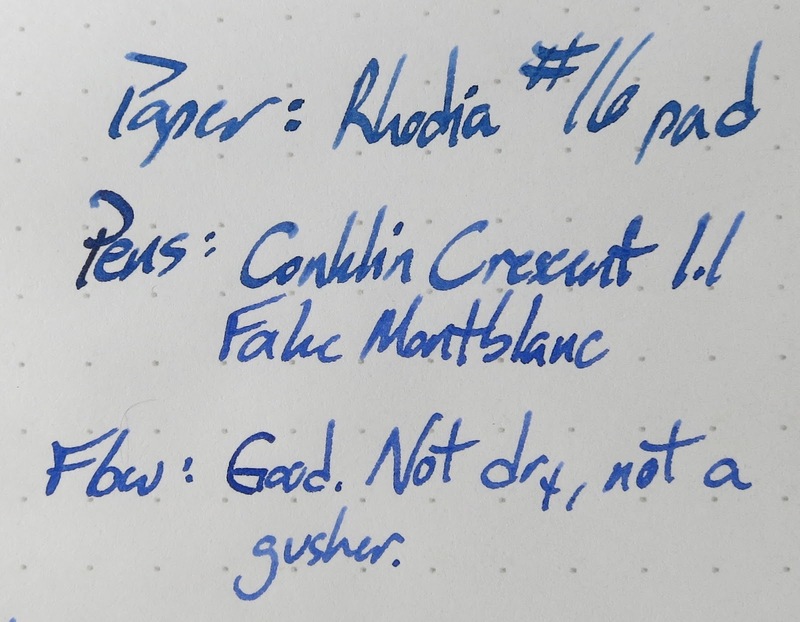 The best thing about this ink, though, is that it behaves itself really well on low-end copy paper. Almost no bleed, feather, or spread on my test paper. Pretty impressive! Above: SHEEN! 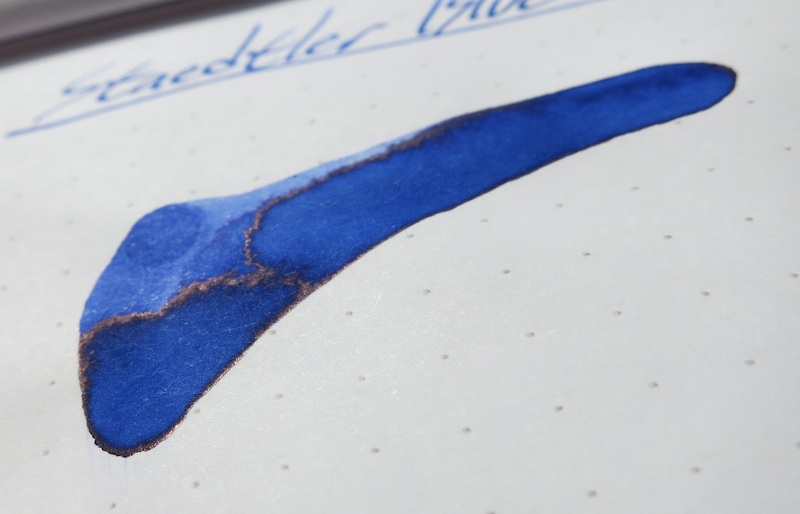 You'd have to put it down pretty thick to get this sheen, but it does look rad. 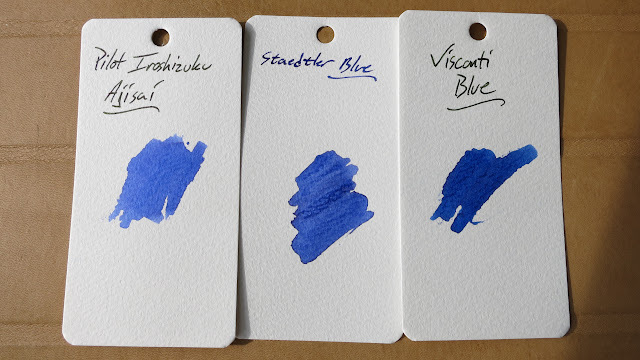 Shocking blue is pretty hot. It's coming up soon. This is a pretty nice bottle. 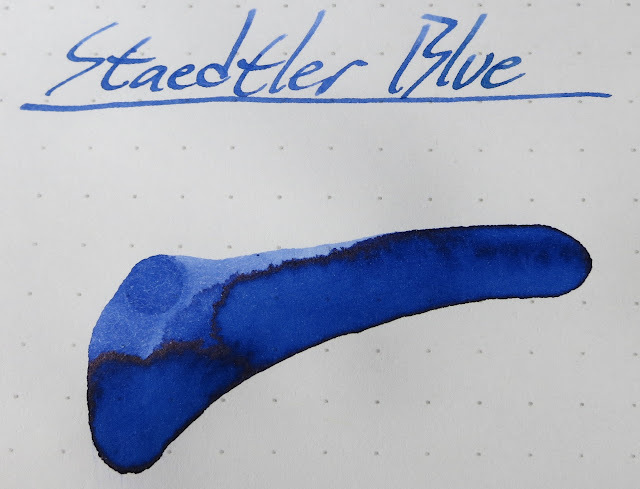 It's a bit shallow, but it's deep enough to accommodate a large nib. Is this picture necessary? Nope. It looks cool, though, so it got included. Look at that! Hooray for good behavior on copy paper! 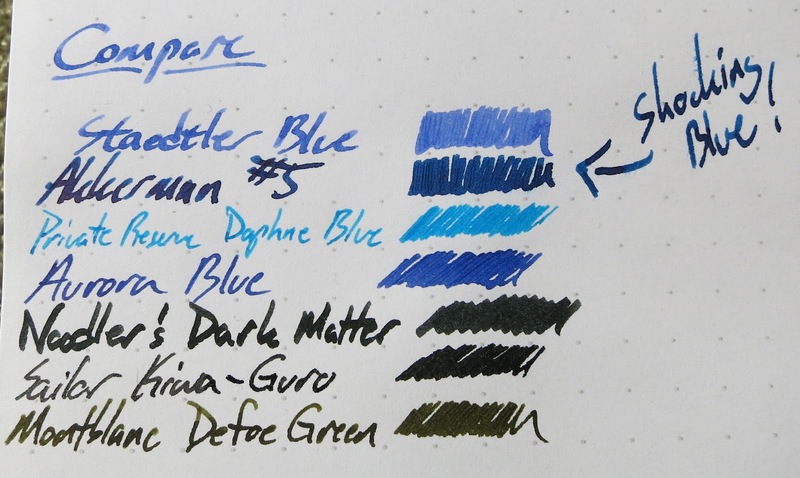 A whole bunch of ink swatches! 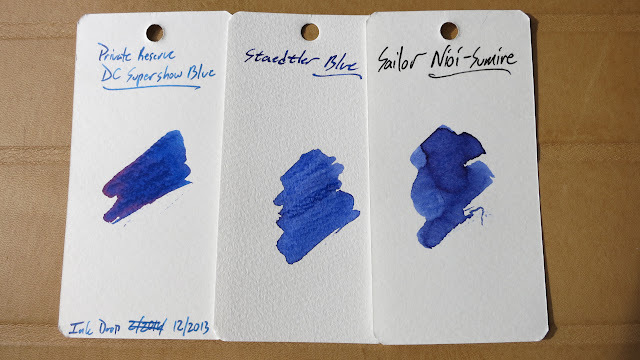 I went through my ink swatches and found some that are close to this Royal Blue. Kaweco Blue is fairly close, but it lacks the sheen that Staedtler exhibits. 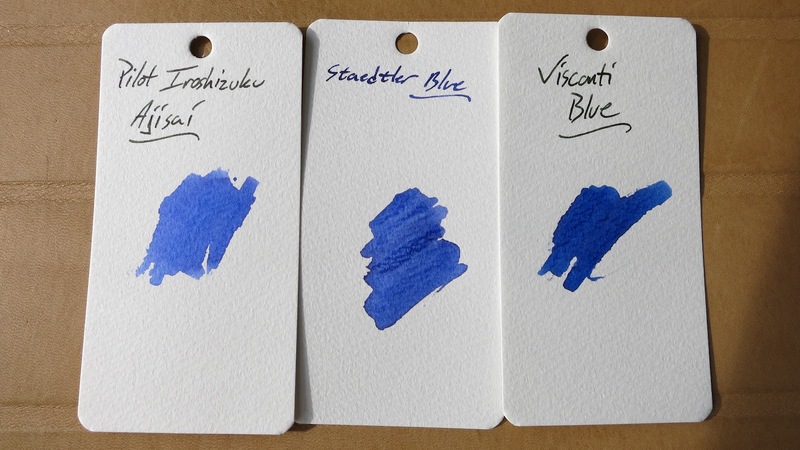 I'd say that Royal Blue is somewhere in the middle of Ajisai and Visconti Blue. Bungbox Sapphire isn't that close, but it's pretty so I included it. Not much to this one. It's blue. Water Drop Test and Video Review! So, I really like this one. It's going to make it into the rotation, I think. We'll have to see how the black ink shows up. They only make a blue and a black right now. I hope they expand that line soon.